Approach: Located along the Icefields Parkway (Hwy #93N) between Lake Louise and Jasper. It is a little over an hours drive from either Jasper or Lake Louise, and is South of the Columbia Icefields. It is easily visible from the highway a few km’s South of the Weeping Wall. Follow the drainage to the first pitch. Many parties cheat a bit and walk up around the first small pitches on the left. Route Description: The one and only Polar Circus is perhaps most famous waterfall ice climb in the world, and rightly so! This massive climb starts just 5 minutes from the road and consists of pitch after pitch of progressively harder ice climbing. It lies in a large avalanche path, and there have been many fatalities over the years, so be sure to choose your day wisely. 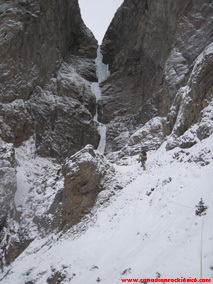 Climb a few pitches of WI3-4 ice until reaching the hanging dagger of the rarely formed pitch called The Pencil (WI6). The Pencil often comes close to forming and then collapses, something to keep in mind when considering conditions on the route. Climb a pitch of WI4 mushrooms to the right of The Pencil, then traverse right on snow slopes to some small trees. Scramble up through a weakness in the small cliffband, and then traverse snow slopes back left to the ice. 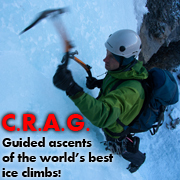 A few more pitches of consecutively steeper ice lead to the top, with the hardest climbing right at the end! Descent: Rappel the route from v-threads and bolted anchors. You can traverse around the bottom few pitches on slopes to the left (looking up). Gear: Screws, 2 X 60m or 70m ropes. Objective Hazards: Lots of avalanche & icefall hazard, there have been many accidents.